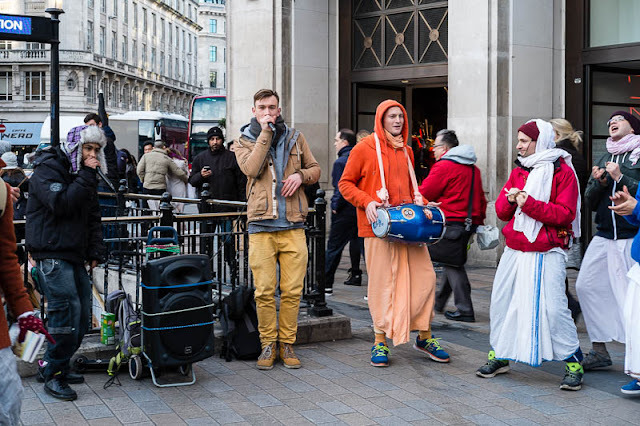 An unlikely combination occurred when the Hare Krishna group, who are regularly found chanting along Oxford St, arrived at a corner where Beatboxers where busking. They were looking for a little back-up music. I haven't seen a Hare Krishna group in years! Go beatboxers in this case! The only time we see Krishnas around here is on Canada Day when they set up somewhere downtown and start chanting. It just sounds like Hare Krishna said over and over again to me. I have seen and HEARD them up and down the pavements in London.